The Nike LeBron 16 Oreo will be another familiar colorway of LeBron James’ signature line that will be releasing later this Fall/Winter season. 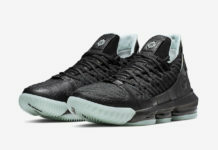 Look for the Nike LeBron 16 “Oreo” to release later this year at select Nike Basketball retailers and Nike.com. The retail price tag is set at $185 USD. UPDATE: Nike releases official photos of the “Oreo” LeBron 16.